I discovered this cottage whilst out walking in the small hamlet of Osmaston which is situated between Uttoxeter and Ashbourne in the County of Derbyshire. Osmaston has numerous thatched cottages, some that I have painted before, such as ‘Lane End’, which is around the corner from the above painting. With the privilege of artists licence I renamed it Lane End because it was situated at the bottom of the road. With licence again I changed the tarmac to a dirt lane and added the Rhode Island Red chickens and the figure having just fed them leaving the scene. Commissions are welcome any subject, please click here. I discovered this scene of a thatched cottage in a place called Little Hazley which is situated in Oxfordshire, a virtually untouched part of our English landscape where time stands still. I changed the road from tarmac into a dirt path which I thought would be more fitting for this type of scene, beside I don’t much like tamac in paintings! The painting was snapped up at an exhibition I had in Staffordshire. Commissions are welcome, all subjects, please contact me here. Sunday afternoon a young couple take a pony and carriage ride passing a thatched cottage in a quiet rural backwater of the Gloucestershire countryside. Beside the aesthetic charm of this picture, the object and fascination was to convey to the viewer the atmosphere of light and shade, and the strong contrast between bright sunshine and dark shadows where the sun fails to reach, where one is almost blinded when looking into the shadows. 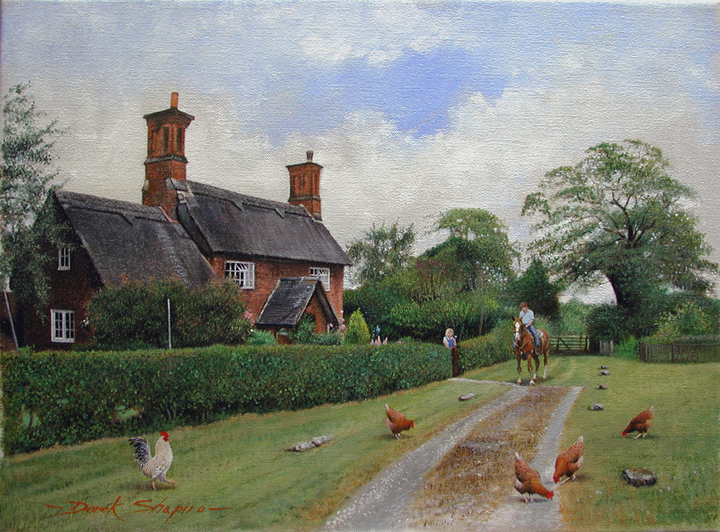 The thatched cottage in this painting is situated in Osmaston , a small Derbyshire country estate village. This pretty village is the arc typical English village – thatched cottages, village green, village pond – pub and church! Always a good subject when I feel stuck to do a painting. This thatched cottage is situated in Osmaston , a small Derbyshire country estate village. This pretty village is the archtypical English village – thatched cottages, village green, village pond – pub and church! These thatched cottages are situated in Osmaston , a small Derbyshire country estate village. This pretty village is the archtypical English village – thatched cottages, village green, village pond – pub and church!